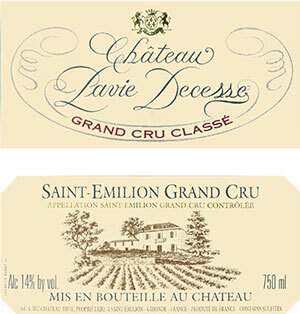 Pavie Decesse, a much smaller vineyard (9 acres) than Pavie, produces just over 400 cases of wine. The vines average 45+ years of age, and the blend contains no Cabernet Sauvignon and much less Cabernet Franc than Pavie. Yields are similar for the two estates, but Pavie Decesse exhibits more espresso, chocolate, and caramelized Merlot-like flavors, and reveals a certain freshness and precision because of its exquisite limestone-based terroir. A blend of 90% Merlot and 10% Cabernet Franc, the blockbuster 2005 Pavie Decesse boasts an inky/purple color as well as a gorgeous nose of crushed rocks, acacia flowers, blackberries, blueberries, and a super-concentrated cranberry-like note. Its well-integrated toasty oak component is more noticeable than in the Pavie. Exceptionally concentrated, powerful, and long, it is meant for long-term aging in spite of the high percentage of Merlot. Anticipated maturity: 2018-2040+. The Château Pavie-Decesse 2005 has an exotic and irresistible bouquet with immense purity: crème de cassis, blueberry, vanilla and violets. The palate is medium-bodied with sumptuous tannin, well-judged acidity, fine structure and poise. There is great depth here, very sensual and with a powerful sweet cassis finish that feels just a little top-heavy and unlike the superior Pavie ’05, shows a little dryness. Give this another few years or so in order to find its equilibrium.